When I think of skin care products I like to think clean, natural, and organic. I want something that is going to work and is relatively inexpensive. It has to be something that will give me the best results possible. I may have found all of the above in MyChelle Beauty Key 3. 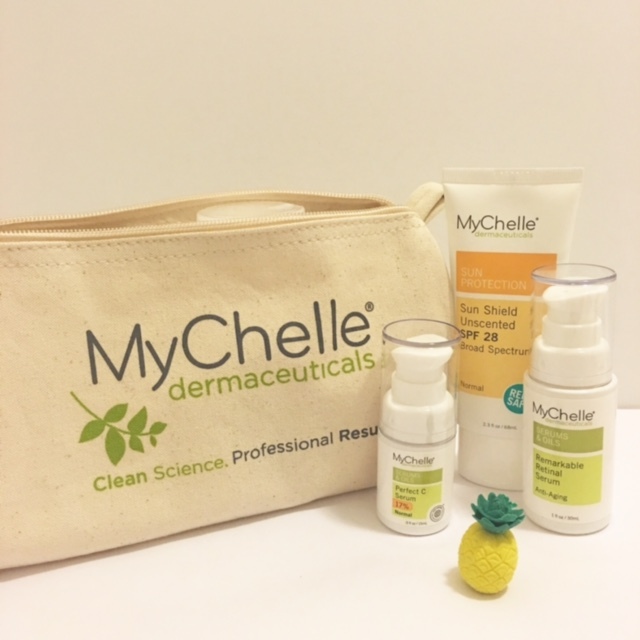 MyChelle skin care products take a different approach to skin care. MyChelle’s approach is to provide clean, conscious, and comprehensive skin care products that are bio active, ethically sourced, and formulated with high performance ingredients. When I found out that I would get the opportunity to try MyChelle Beauty Key 3 products I didn’t think much of it. If you’ve tried one you’ve tried them all. WRONG. The Beauty Key 3 includes a Perfect C Serum. This includes the highest (17%) and most effective Vitamin C available. It is followed by the Remarkable Retinal Serum that has the strongest non-prescription Vitamin A. The Beauty Key 3 is rounded out by the Sun Shield SPF 28 with safe 100% mineral UVA/UVB protection. These three power products have 10 skin benefits. Read ’em and weep girls! I believe that individual results will very but let me tell you about mine! I used the Beauty Key 3 for a total of 14 days and here is what I saw. I can’t say just yet if there was a reduction in my wrinkles but with continued use I may. I really wanted my dark spots to go away like yesterday but I didn’t see those results just yet. I love the fact that a lot of the benefits include things that we can’t see externally. I like knowing that my skin is protected if I go outside with the SPF 28 on. If you are in the market for products that are vegetarian, cruelty-free, and free of phthalates, parabens, sulfates, ureas, artificial fragrances/colors, petroleum, GMOs, and gluten, then look no further. MyChelle Beauty Key 3 is your way to perfect, correct, and protect.